Publisher: David and Charles Ltd.
From the same publisher as the excellent book ‘Keeping Chickens’ that we reviewed on poultrykeeper back in January, Keeping Ducks and Geese by Chris and Mike Ashton certainly doesn’t disappoint. Just like “Keeping Chickens”, it is very well presented with excellent colour photos and diagrams and it is packed with useful information. The authors Chris and Mike Ashton probably need no introduction. They already have several other book titles to their names and are regular contributors to specialist magazines. For those of you that are perhaps new to keeping ducks or geese, they have over 28 years of experience breeding waterfowl and have won numerous British Waterfowl Association Awards for their ducks and geese. Both Chris and Mike have chaired the BWA Standards Committee and Mike is currently the chief judging examiner for the BWA. 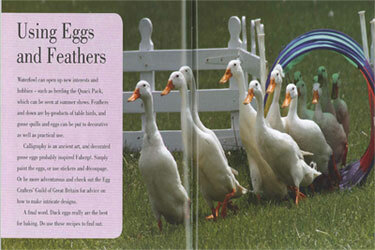 The book is very much a ‘lifestyle guide’ to keeping ducks and geese. The facts are broken down and well presented between some excellent colour photos and illustrations (there are 100 colour photos and 30 colour illustrations in the book). Many of the colour photos were taken by the authors of their own birds. The content is authoritative and well written, as can be expected of the Ashtons. Amongst other things, the book covers what to consider before buying, how to house and feed ducks and geese, their welfare, egg selection as well as hatching and rearing young ducks and geese. Certainly not just a beginners guide, I found many new interesting facts could be gleaned throughout the book. In the middle of the book, there is a detailed section of 37 of the most popular breeds, broken down into categories such as traditional and specialist breeds, egg layers or table breeds. Each breed has a useful ‘fact file’ for reference, a photo of the breed and a detailed description of the duck or goose, enabling you to learn about the breed or decide which breed is best suited to you. The end of the book covers the more advanced topics such as breeding ducks and geese by natural means or by using an incubator. There are some good photos of candled eggs and there is lots of useful information on rearing ducklings. 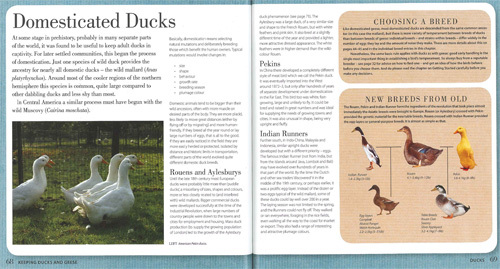 To finish off, a lavish lifestyle section provides recipes for using duck eggs, together with activities for the family including quill making, fairy stories and folklore as well as information on how ducks can help with sheepdog training! 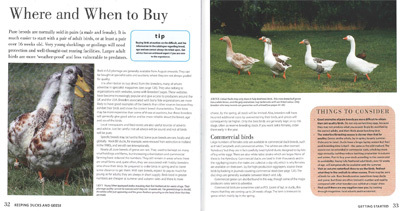 Keeping Ducks and Geese fuses contemporary lifestyle design and an authoritative text and will appeal not only to those who already keep waterfowl and want to fill some gaps in their knowledge, but also to the complete newcomer thinking of keeping ducks and geese or even just aspire to the self sufficient lifestyle they represent. At the time of writing this review, it costs a mere £10.49 on Amazon. I have not been able to put it down and can wholeheartedly recommend it.